Buy Betty Crocker Super Moist Spice Cake Mix. Make your life a little sweeter today with Betty Crocker cakes! 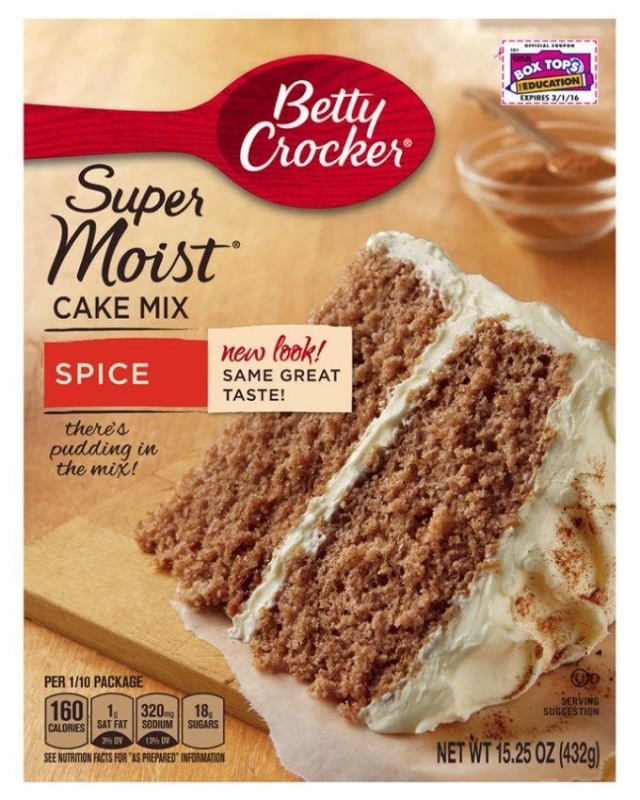 Betty Crocker Super Moist cakes are today's family tradition, for special occasions and those spontaneous celebrations when only "homemade" will do. Enriched Flour Bleached (Wheat Flour, Niacin, Iron, Thiamin Mononitrate, Riboflavin, Folic Acid), Sugar, Corn Syrup, Leavening (Baking Soda, Sodium Aluminum Phosphate). Contains 2% Or Less of: Modified Corn Starch, Corn Starch, Cinnamon, Partially Hydrogenated Soybean And/Or Cottonseed Oil, Spices, Propylene Glycol Mono And Diesters of Fatty Acids, Salt, Distilled Monoglycerids, Dicalcium Phosphate, Sodium Stearoyl Lactylate, Xanthan Gum, Cellulose Gum, Color Added. Contains Wheat; May Contain Milk Ingredients.